Christmas is soon upon us so I gathered ingredients and started preparing my home made gifts. I like to make five or six items that I pass along to friends and family. 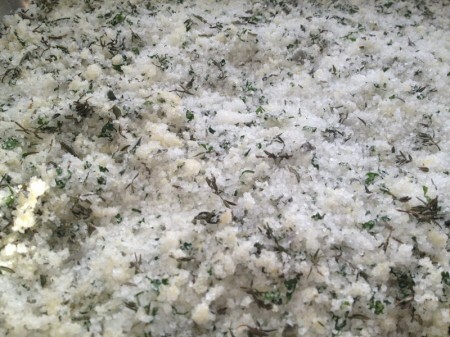 I’ll feature one a week: first up is herb and garlic sea salt. Combine chopped herbs and crush or grated garlic with coarse sea salt and let dry for a day or two. The preparation is simple and the final product is wonderful: a perfect seasoning for all meats and a variety of roasted vegetables. I made two batches, each with two kilograms of coarse sea salt. The first batch had a large bunch of thyme, a large bunch of sage and a half a large bunch of parsley. The second batch had a large bunch of rosemary, a small bunch of sage, a small bunch of thyme and half a bunch of parsley. Use whatever herbs you enjoy in whatever quantity you want: I like it very herby as you can see above. After taking the herbs off the stems I finely chopped all the herbs and added them with the salt into a large mixing bowl. To that I grated fifteen large pieces of fresh garlic and gave it a stir. Then I poured the mixture onto a sheet pan and further mixed it with my hands. You can see in the picture above the yellow areas where the garlic has made the salt wet and clumped together: get into those areas and really mix the garlic thoroughly into the salt. Let the mixture dry for a day or two and then put into whatever containers you’re planning to use; I distribute it in 250 ml canning jars. This mixture keeps for months without issue: the salt dries the herbs and garlic, preserving them and making a very aromatic seasoning. I’ve used this mixture on all varieties of roasted and barbequed meats and vegetables. A little goes a long way. It’s very nice rubbed under the skin of a chicken or turkey, or rubbed into a beef roast. Take all the herbs off the stems and finely chop. Add salt and finely chopped herbs to a mixing bowl. 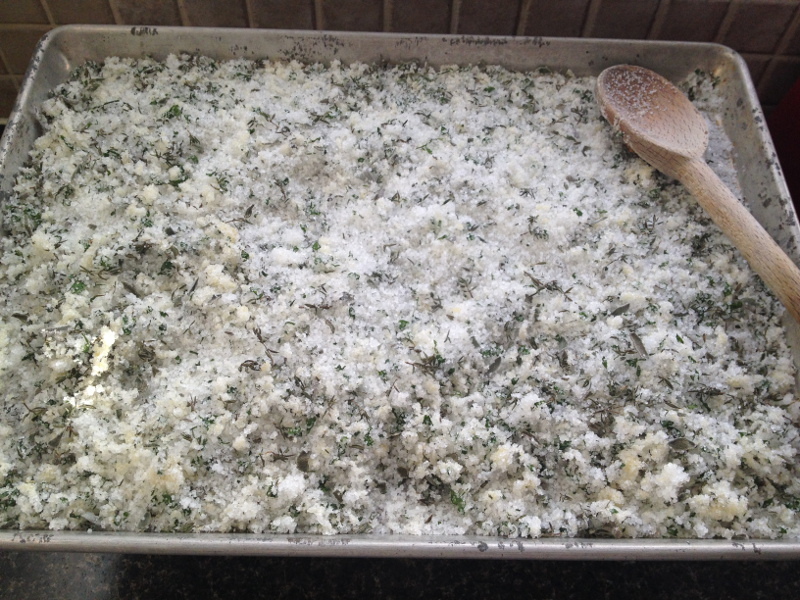 Grate or finely mince the garlic and add to the mixing bowl. Spread onto a sheet pan and let dry for 1-2 days.